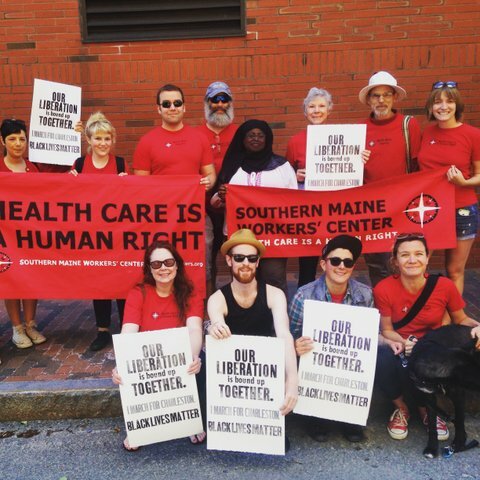 Our Campaign to Transform the Health Care system in Maine! Too many people in our communities go without the care that they need or are burdened by unjust medical debt. We know from the experiences of the people around us that health insurance is not enough. We believe that a health care system treated as a public good and based on the human rights principles is a fundamental step toward economic and racial justice in our communities. That’s why in 2013 SMWC committed to building the collective power of working-class, low-income, and un- or underinsured people to demand and win a universal, publicly-funded health care system in Maine. The campaign strategy is to focus on developing leadership around the state by collecting people’s health care related stories through surveys, establishing organizing committees across the state, and holding town hall style speak-outs to build grassroots power. 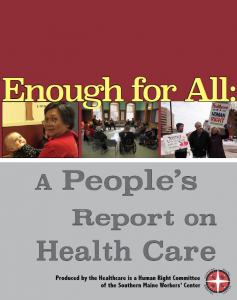 In May, 2017 we released Enough For All: A People’s Report on Health Care, based on thousands of grassroots conversations we’ve had over the last four years. Our aim is to build a movement powerful enough to change what’s politically possible in Maine. Please read and share this report. Talk about it with your friends, family and community members. Contact us to organize a report reading and potluck in your community: melissa@maineworkers.org. Making health care a public good that is universally available & equitably funded. It’s going to take a mass movement of Mainers from all over the state to transform our health care system. This is an issue that touches all of our lives and is a point of unity for people of all backgrounds. We need all of our stories and all of our leadership in order to win our campaign for a health care system that works for people and not for profit.